Please compress your final film using the following specifications. File Type: .MOV or MP4 or M4V preferred. If your film is 2.35:1 aspect ratio, please deliver a 16:9 file with 2.35:1 letterboxing. If your film is 4:3 aspect ratio, please deliver a 16:9 file with 4:3 pillar-boxing. Please visit http://www.vimeo.com/help/compression for software-specific tutorials for compressing your final film. After you have rendered your final file, please take time to watch it in its entirety to ensure it looks exactly the way you expect it before you submit. Films must be delivered online, unless previous arrangements have been made. Make sure you have a Google account. If you don’t you can create one for free. 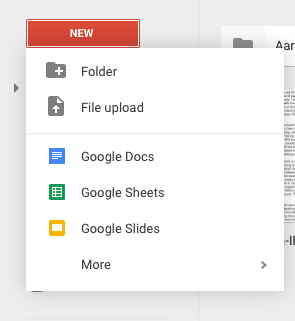 Log into your Google account and navigate to your Google Drive. Select “NEW” and choose “File Upload” from the dropdown menu. Locate your file on your computer or drive and upload it. 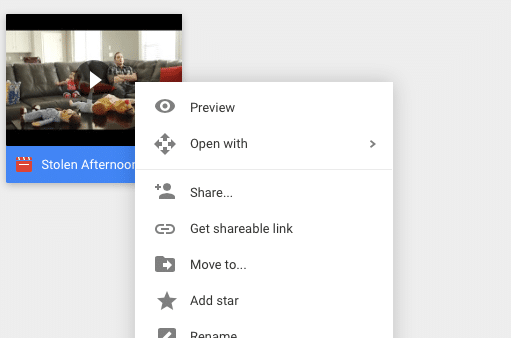 Once your file has uploaded, right click it and choose the “Share” option. *** IMPORTANT! *** Your film will be judged as “delivered” based on the date/time stamp on the email that we receive from Google. So, please be sure you allow time for “Internet Traffic”. Please do not try to upload a pro-res file or other large file format. One indicator that you might be uploading a pro-res or other high-resolution codec is if you have a very large file. Your file should be less than 1gb. We will reply to you to verify that the file has been downloaded and verified as soon as possible after receipt. However, the more people that email and ask if we received the film the more it slows down the process of checking the films in. Google Docs has been tested and verified as reliable. If for some reason the above instructions are not working for you, it is up to you to find a way to deliver your final file to IFP Phoenix. You may use an alternate service like yousendit.com, etc. Your film will be judged as delivered based on the date/time of the email we receive from such a service. You can also had deliver a file to David. However, hours and availability may vary. You will need to contact him at david@ifpphx.org in advance of the turn in.